Since I last posted on the Mar12 Dark Cloud Cover closing at 1,653, FKLI has dropped another hefty 36pts to close at 1,617.5 today, Mar18, hitting an intraday low of 1,608 in fact. So, the Mar12 setup targeting 1,674 high has obviously failed. The previous rebound from 1,593 low ended at 1,668.5 high, & had subsequently reversed into the current down swing. When the index readjusted & closed down 13pts on Friday below its mid-band support of about 1,635, FKLI follow suit with a last-15min plunge below its own 1631-34 support, & closed low 1,625.5. I was doubting the violation of the daily mid-band support, as the news of a change of weightage effective Mar18 on the KLCI components seemed little known. I wasn't aware of the change myself, until being alerted by my broker following the plunge late Friday. Well, the doubt on whether the violation of the mid-band was all cleared when we open gapping lower to 1,618.5 this morning on FKLI. Price then retest 1,620-21.5 level but soon gave up & plunge together with the underlying cash market, hitting a low of 1,608, an hour into trading. Later saw price rebounded to congest around 1,614-1,619 range before closing at 1,617.5 for the day. Okay. I must admit recent price movement on the FKLI is confusing me & my analysis, while its eating into my capital with its wild swings up & down. Initially, I was seeing it as a consolidating flat within 1,587-1,640 range. 1,668.5. Unfolding in 3-waves patterns, rather than the motive 5-waves movement. pullback, following the violation of daily mid-band support around 1,631-33 on Friday, Mar15. Counting the drop from pivot high of 1,668.5, it is quite possible that the correctional mode since late Jan might have ended. To confirm the resume of the previous downtrend from 1,705 peak, we will need to see further drop below today's low of 1,608, giving a 5-wave pattern to the current down swing from 1,668.5 high. This is the counts I drafted on my trading log after market close. Shall anyone find something funny with the counts, kindly let me know so I can rectify it. Assuming the counts are right, a fibo projection gives the next drop an end-target of around 1,587. Shall we go there tomorrow, it will spell the resume of the downtrend from FKLI all-time high of 1,705. Of course, there's another much safer way to trade the market from here. Assuming we have yet to finish with the drop from all-time high of 1,705, we expect further downward movement. Hence, we can patiently wait for a convincing break below the LT support of 1,587, then safely enter our trade at the first retracement high. 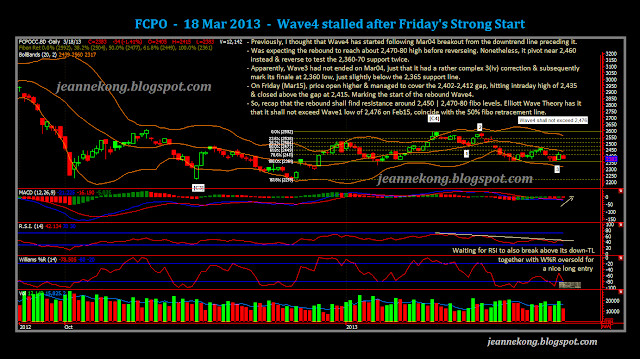 CPO price failed to continue the bullishness saw on Friday, Mar15. Price opened slightly lower & gradually retracing Friday's rise in a small 30pts range day, closed 2,383, below previous immediate support of 2,390-2,400. The level of 2,360-70, proven solid after several test past two weeks, shall not be violated for the Wave4 to continue unfolding to the upside. Overhead, resistance is still the same at 2,400-20 | 2,450-70. Wave4 shall not overlap Wave1, hence, mark our ultimate resistance at 2,476, Wave1 low registered on Feb15. The Mar1-20 export figures due out soon might be the reason behind the quiet range, as traders could be holding back on their positions for the moment. KLK CEO is reported to express concern on Malaysia's expiring GSP status with the EU in Jan'14. Losing the status may further depressed the already weak export demand for Malaysia CPO, as rival Indonesia lower-taxed exports will appear even more attractive than now. This may add to the misery of our current high-stockpile, low-demand CPO industry, not to mentioned the suppressed price squeezing tight on the operating margin. While it's still about three quarters away from the GSP expiry, sooner or later, the issue will come to focus, given that EU's (3rd largest importer) rising demand is one of the few new market segment our local exporters are targeting, amid slowing demand from our biggest importer, China. Anyway, we'll see if the bulls are ready to move again in this new trading week. Fkli is such a difficult market to trade. I had so much love hate affair with this market. FKLI is a devil in disguise...it seems simple but the highly manipulated environment can grind down ur confidence. It has been really tricky lately, complex correctional waves, sideways..wild swings..etc. Im sticking to the basics & classical TA, staying sidelines mostly until the real opportunity arise. Sometimes I feel CPO can be much more straight forward, or rather TA-reliable. Probably because it is higher in liquidity & more tangible as its supply-demand driven. Anyway, keep the faith, stay discipline. We shall survive the crankiness! Price still stuck in correctional mode after recovering from 1,608 low registered on Monday, Mar18. Price oscillate within tight range in unexciting low participation. Though volume improved very slightly today, probably caused by the early morning gap down to 1,615 low which quickly V-shaped back up to 1,628-29 high. Resistance is the support-turned-resistance 1,630-35 range, previous consolidation bottom/daily mid-band. Support at 1,615-25 | 1,600 | 1,585-95. 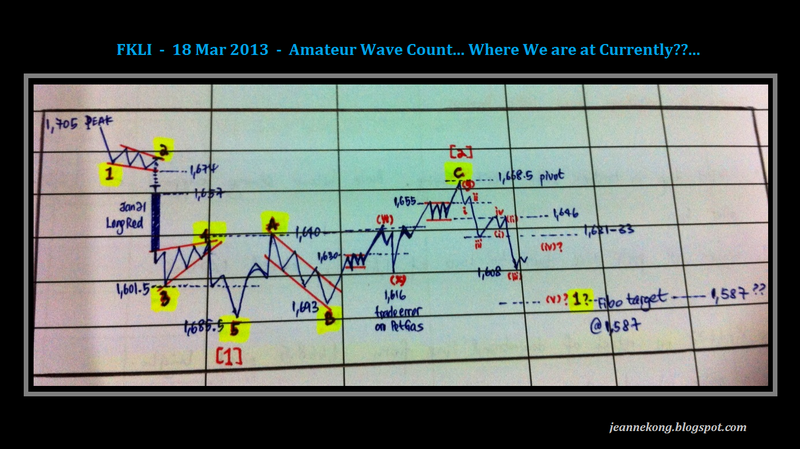 Price trending up nicely in an upward correction Wave4, after pivoting from 2,360 low last Thursday, Mar14. Price has partially covered the Mar12 opening gap at 2,442, recording a day high at 2,446, as of writing (1745h). Immediate resistance will be at 2,450 above the gap. Follow by Wave4 target of 2,477 based on fibo projection & Elliott Wave Theory. March1-20 export figures out today was pretty rosy, ITS up 11% mom, SGS up 14% mom. Coupled with last week's MPOB inventory data which shows easing of the record stockpile level end-Feb'13, this should bolster well for the on-going Wave4 rebound. Finally, CPO is done with its tantrums & got back 'on track' for a nice correctional upwave. While for FKLI, its either I'm not skillful enough, or the market is as confused as me. Its basically going nowhere, largely sideway within 1,587-1,640/50 range. Its risky to go long even if it's near the lower end of the range, given the ever-lasting rumor of parliament dissolution, which has yet to come true. @_@"
Hence, will maintain a short approach on FKLI, waiting for the current correction to peak, patience shall prove worthwhile under such a harsh market environment. Wish all the Best of luck! I wonder, whether this has anything to do with me being a right-brainer who was forced to change to write with my right hand, later pursued a very technical left-brained engineering degree. Deep down inside, the right-brainer in me still prevails, which i think makes me see the charts & market from a very different yet interesting perspective.